WORLD CLASS FISHING IN THE FRONT YARD…. The Nantahala River Lodge sits on the bank of the Nantahala River and is centrally located between many of the best trout streams in the state. The upper section of the Nantahala, which is a delayed harvest stream, flows through the front yard. The beginning of the lower section, which is hatchery supported, is within walking distance. The Nantahala River truly exemplifies a great trout stream. The Nantahala is listed as one of the nation’s top 100 trout streams by Trout Unlimited and has been featured in numerous magazines. The Nantahala River represented two of the five venues for the Fly Fish Team USA National Championships in 2011 and the 2012 Youth National Fly Fishing Championships. The Nantahala River is the most diverse trout fisheries in all of the state and is one of the finest rivers in the Southeastern United States. The Nantahala has something for everyone. In addition to the great trout streams, several wonderful lakes and rivers are nearby. If you would like a guide service or decide to explore other fishing areas here are a few of our favorites. 153 Charters is captained by James McManus, a U.S. Coast Guard licensed charter boat captain. Captain McManus focuses on the area lakes, but will combine trips to incude some fly-only stream trips into the Great Smoky Mountain National Park. He can accommodate up to three people. Methods are dependent on the species and time of year, but can include casting artificials, bait fishing, trolling, fly-fishing and night fishing. Book a trip and let Captain McManus share what is one of the most diverse fishing experiences that can be had anywhere in the country. Dale is a Native American and also a Nantahala native with years of fishing experience on Nantahala Lake. Dale is a retired Park Ranger with 13 years experience as a certified boating instructor and a wildlife technician. Dale has great knowledge of our area lakes and provides guided fishing and sightseeing trips on Nantahala, Fontana, Hiawassee, Santeetlah and Nottely Lakes. Dale has all of the knowledge needed to provide you with a safe, funfilled fishing trip or a leisurely boat tour. Bass fishing – largemouths, smallmouths and spotted bass on Nantahala, Chatuge and Blue Ridge lakes. Located just seven miles from the Lodge, the Nantahala Fly Shop at Endless River Adventures is stocked with a collection of local flies chosen for this area, brand name gear, and great advice on the area. Fishing licenses may be purchased here. If you purchased your fishing license from an outside shop, make sure that they included a trout stamp, as it is necessary in Western North Carolina. Smoky Mountain Guides is an adventure guiding company in Gatlinburg, Tennessee. They offer guided hikes (day and overnight), fly fishing trips, kayak tours, and auto tours of the Smoky Mountain region. Their guides are well experienced and personable and are willing to accommodate the client in the best way possible. Contact them for your next adventure. A first-class trout stream, offering a mix of wild trout waters in its upper reaches, delayed-harvest fishing in its mid-section, and a mix of healthy stream-raised and stocked trout in its lower portion. Because of the white water activities during the day, the NC Wildlife Resources Commission allows night fishing downstream from the power house. 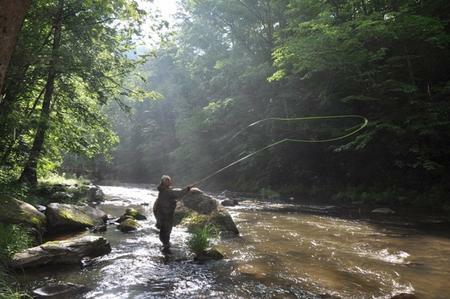 The 2011 Fly Fish Team USA National Championships and the 2012 Junior USA National Fly Fishing Championships were held on the Nantahala River. The Nantahala River Lodge enjoyed supporting and participating in these events. Slick Rock offers the best opportunity in the state to catch a really big wild brown trout and offers native trout fishing in the headwaters. Fires Creek, a great stream off the beaten path, has reclassified a 2.2 mile section in Clay County from Wild Trout Waters to Delayed Harvest Trout Waters (USFS Road 340A to the foot bridge in the USFS Fires Creek Picnic Area). Located high above the Nantahala River Gorge at a 3,000-foot elevation – a pristine and serene lake with just 30 miles of shoreline. Many anglers enjoy fishing the Nantahala reservoir due to the low number of boaters and the breathtaking scenery. Fish in the lake include Walleye, Crappie, Sunfish, Trout, and Bass. And it’s the only lake in the South with a population of freshwater Kokanee Salmon. There are two public boat launching areas – the Rocky Branch Ramp is on the east shore just off Wayah Road and the Choga public access area is on the west shore. Lakes End Marina, on Wayah Road, rents pontoons, fishing and ski boats. You can fish from the bank. There is a small park with a picnic table, boat ramp and a handicap fishing pier. Canoe or small boat fishing is recommended. Fish in the lake include Crappie, Sunfish, Trout, Bass and Catfish. Clear, deep and very river like in character. Current pushes through the whole lake when power is being generated through Cheoah Dam. Trout fishing is best when the water is running. Trout are plentiful on Calderwood, and they tend to grow large. Rainbows are the main species, but recent NCWRC stockings also have included brook trout and brown trout. The Nantahala River Lodge is located on Delayed Harvest Waters. These are stocked trout waters open to fishing year-round, but trout caught between October 1 and the first Saturday in June must be immediately released. Single hook, artificial lures or flies are required during the October-June period. Beginning the first Saturday in June, harvest of trout from these waters is allowed, and anglers can use natural bait. “Hatchery Supported” trout regulations apply during this time. Beginning October 1, these waters revert back to “Delayed Harvest” trout regulations. We encourage catch and release year round. Note: The River Lodge has a circular drive to provide easy access and plenty of room to maneuver your boat and trailer.